WASHINGTON — At a Religious Freedom Project summit Friday at the Catholic University of America, a Chinese evangelist told of how she was was forced to make Christmas tree lights and endured starvation, electrocution and beatings in Chinese prisons and "re-education" labor camps due to her refusal to renounce Christ. Liu, a born-again Christian who was baptized in 1991 in the dead of a winter night due to fear of a government crackdown, told of how she and ministry partners traveled through China's Hubei province, going village to village, to spread the word of Christ. In 1991, Liu, who is now an American citizen since coming to the United States in 2005, was arrested along with a co-worker because they were evangelizing and charged with "disturbing social order." Liu was detained in a local jail for two months. "The police took me to a police station and they asked a lot of information about my pastor and my friends. … And they ask me [to] give up Jesus Christ. [I said], I don't want to do that.' So, they beat me and they used the electric bar, an electric baton, that can shock your body and burn your skin," Liu detailed. "So they put it to my head, my body, everywhere. And then they put it into my hands. It is painful. I was screaming. Then they put the baton in my mouth, so my whole mouth is so hurt, and I couldn't drink, couldn't eat and couldn't talk. They still asked information. And then, they give me shock chains on my ankles." "No bathroom, no drink, no break. My whole faith was worn so very badly," Liu continued. "I believe in Jesus, but my physical body feels so painful. When I fall down on the floor, then they yank me up and spin me around, hold my hair and lift me up from the ground. When I fall down on the floor again, they use their feet to smash my hands on the floor. All this pain I can't endure, that is why I pray to God. … That's why I think about Jesus dying for me, and I [can] die for Him." In 1996, Liu was again arrested with a colleague in the Hubei province and again charged with "disturbing social order." Liu told the audience that she was never given a trial or due process before she was sentenced to three years in a woman's labor camp, an entity which the Communist government uses to try and re-educate bad behavior through labor." "I was singled out because of my faith. I was sentenced to the women's labor camp. I was always singled out. One day, we walk in and we were hot in the labor camp factory. Then it is lunchtime, I was in line for food and when it was my turn to get food, they asked me, 'Do you still believe in Jesus?' I said, 'Yes,''' Liu proclaimed. "Then they tell me to go and face the wall and stand there. After all prisoners finished their lunch, then they ask me to go with them to work. When it was dinner time, I was in line to get food and it was my turn, and they still asked me same question. … My physical body is hungry, but I [didn't] want to give up Jesus. I was told to face the wall the whole night and in the morning, keep working again." After getting released from the labor camp, Liu was arrested again in 2001 on her birthday and charged with a more serious offense of "crime against the state." She and her co-workers were able to successfully win an appeal against their charges with the help of lawyers from Beijing. However, Liu was abducted by local police after the ruling and subjected to three more years in a women's labor camp. "I was in prison working on Christmas lights and earphones sent to Americans or sent to different countries. I have a relationship with other prisoners. I want to share Gospel with them. My purpose is to share Gospel with people, even in prison," Liu stated. "I ask my mom to hide very small spiritual book to give to me so I can share with a prisoner. When she was reading the book, and the guards found it, the guards immediately found me and told me, 'Sarah, I will add to your prison time because you still do same thing and you didn't repent.'" 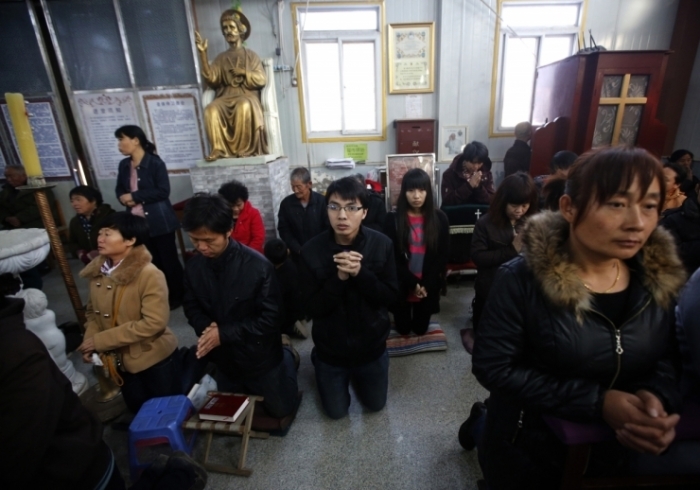 "But for me, I want to continue the commission from God to speak the Gospel," Liu added.